Within easy reach of all the attractions of the Périgord region, M. and Mme. 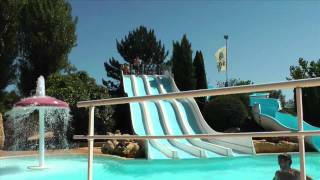 Havel have created an attractive and friendly family campsite at les Péneyrals. There are 250 pitches, 114 of which are for touring. The pitches at the bottom of the hill tend to be quieter as they are further from the main facilities, but are all level and grassy (some on terraces), with electricity (5/10A), and most have some shade. An attractive bar and restaurant with terrace overlook the excellent pool complex and at the bottom of the site is a small fishing lake. The site is set on a wooded hillside with flowers in abundance (thanks to the dedication of Mme. Havel’s mother). Activities are organised over a long season including archery, various sports tournaments, aquagym, discos and a children’s club. On-site entertainment is provided in and around the bar and terrace area every night except Saturdays. 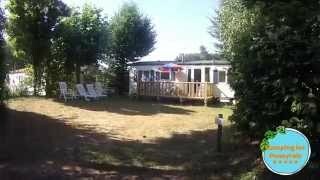 The site is used fairly unobtrusively by a UK tour operator with mobile homes and pre-erected tents. Flights from London arrive at a new airport some 30 km. away, which may prove to be popular with visitors using the rental accommodation. Sarlat la Canéda is just 11 km. away, with its many attractions and shops, restaurants and supermarkets. For those wishing to venture further afield there are endless opportunities and the site reception carries a comprehensive supply of information. Three modern, unisex toilet blocks provide good quality facilities, including provision for babies and disabled visitors. Motorhome services. Good value shop, excellent restaurant and takeaway. 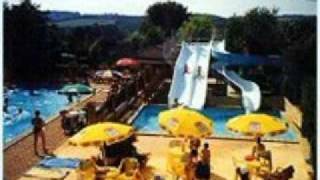 Pool complex with two large pools (one heated), paddling pool with games and four slides with splash pool. Indoor heated pool. Bicycle hire. Minigolf. Tennis (charged). Badminton. Play area. Games room, WiFi over site (charged), TV room and small library. Fishing. Site is 11 km. north of Sarlat. From D704 Sarlat-Montignac road turn east on D60 towards Salignac-Eyvigues. After 4 km. turn south on D56 towards St Crépin-Carlucet. Site is 500 m. along this road on the right.